The Mayor of Tokyo, Hidejiro Nagata, had a dream of bringing the Olympics to Tokyo in 1940. And in order to convince the International Olympic Committee (IOC), he could think of only one Japanese who might have a chance to influence the Westerners, who may have looked on Japan with bemusement at best. His name was Jigoro Kano. Born into a sake-brewing family in 1860, Kano had advantages over the majority of children in Japan. As a teenager, he was able to study English and German in private schools run by Europeans. And since he was physically small and weak and wanted to become stronger, he had access to the very best practitioners of jujitsu. At the age of 19, he performed his art in front of then-former American President Ulysses S. Grant, who was visiting Japan in 1879. Kano became so proficient at jujitsu that he would go on to form his own school – what the world today knows as Judo. The 1932 Los Angeles Summer Games was an Olympiad where Japanese athletes did remarkably well, not only making Japan proud and adding momentum to Mayor Nagata’s push for the 1940 Olympics, but also convincing the West that Japan was an up-and-coming power. On the last day of the Los Angeles Olympics, the IOC held a grand celebratory party, and the person selected to give the keynote was Jigoro Kano. Kano was 72, but full of energy and charm. As Julie Checkoway writes in her terrific book, The Three Year Swim Club, the press in America found him “playful” and “charming”. As Checkoway noted, it was not uncommon for him to lift the hem of his Japanese robes to reveal his legs with a sly smile. But more importantly, Kano was an internationalist. And the world was in need of internationalists. The League of Nations was formed in 1920 in the wake of World War I, which turned Europe into a bloody war zone for over 4 years, resulting in the deaths of 9 million military personnel and 7 million civilians. The spirit of the formation of the League of Nations was to promote peace and prevent the ugly history of world war from repeating itself. The Olympic Movement, established by Baron Pierre de Coubertin, was a precursor of the League of Nations – a philosophy of peace and friendship through the competition of sport. Kano understood the Olympic Movement and the heart of the IOC, particularly the IOC leader, Henri de Baillet-Latour of Belgium. Here is how Checkoway described Kano’s address to the IOC. Jigoro Kano’s remarks at the Biltmore were directed as much at the Belgian baron as at anyone; Kano spoke of the fear that it was too easy for the world to have of other countries. ‘People,’ he intoned, ‘are prone to think that what they are accustomed to is good and right,’ and that ‘whatever is foreign to them is mistaken and harmful,’ and he pointed out that the Olympics, if held in Tokyo in 1940, would serve to echo and reinforce the beliefs and values that served as the foundation set down by the movement’s founder. 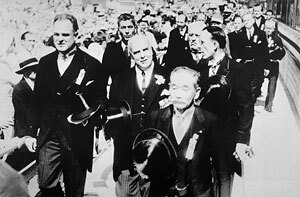 To hold the games in Japan was to extend Coubertin’s vision and to bridge the global gap that existed between West and East and bring together all nations in pursuit, Kano said, of ‘a common purpose.’ And while Kano hadn’t returned home in 1932 with the candidature yet in hand, he had succeeded in appealing to Baillet-Latour and others like him, who were open to a wider vision of the world. And yet, it took another four years before the final decision was made. Kano was now 78 years old. And while he was the face and authority of Japan in the eyes of the IOC, bureaucrats in the Japanese government thought that they could seal the deal by greasing the wheel, which according to Checkoway, created misunderstandings between the IOC and Japan. For example, a Japanese delegate at the 1936 IOC meeting in Berlin apparently tried to convince Mussolini to withdraw Rome’s bid to host in 1940 in exchange for cessation of arms sales to Ethiopia, which Italy was looking to colonize. Baillet-Latour frowned on this blatant attempt to mix backroom political deals with his Olympic Movement. The great founder of Judo, and the visionary Mayor of Tokyo got their wish – an Olympics in Tokyo! Posted in Geo-politics, Japan, Judo, Other Olympics and tagged 1936 Berlin Olympics, 1940 Tokyo Olympics, Henri de Baille-Latour, Hidejiro Nagata, Jigoro Kano, Julie Checkoway, Pierre de Coubertin, Three Year Swim Club, Ulysses S. Grant. Bookmark the permalink.